This major release from Unitronics enables an all in one solution for motor and motion control using the same programming environment as your Unitronics PLCs. 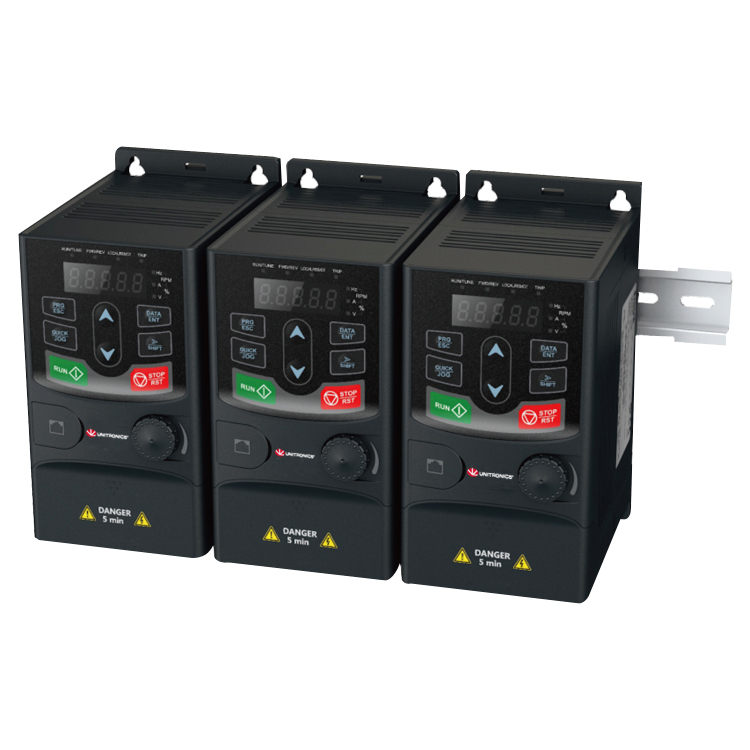 Unitronics VFDs / Inverters can be used as a stand-alone product, or as part of a complete All-in-One package which seamlessly integrates with the PLC+HMI controllers: UniStream®, Vision™ and Samba™. A Variable Frequency Drive (VFD) is a type of motor controller that drives a squirrel cage electric motor (most common standard electric motor) by varying the frequency and voltage supplied to the electric motor. Other names for a VFD are Variable Speed Drive, Adjustable Frequency Drive, Adjustable Speed Drive, AC drive, Microdrive, and Inverter. The most common terms being VFD and Inverter (in the UK). Frequency (or hertz) is directly related to the motor’s shaft speed and is measured in revolutions per minute (RPMs). In other words, the faster the frequency, the higher the RPM. 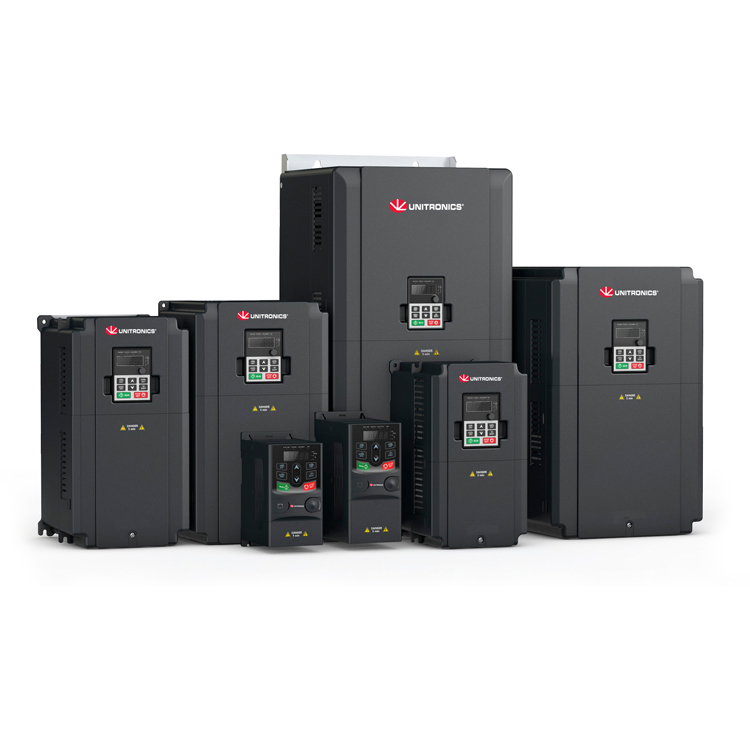 If an application does not require the electric motor to run at full speed, the VFD can be used to ramp down the frequency and voltage to meet the requirements of the application also giving a saving on power usage and increasing motor life (reduces heat). 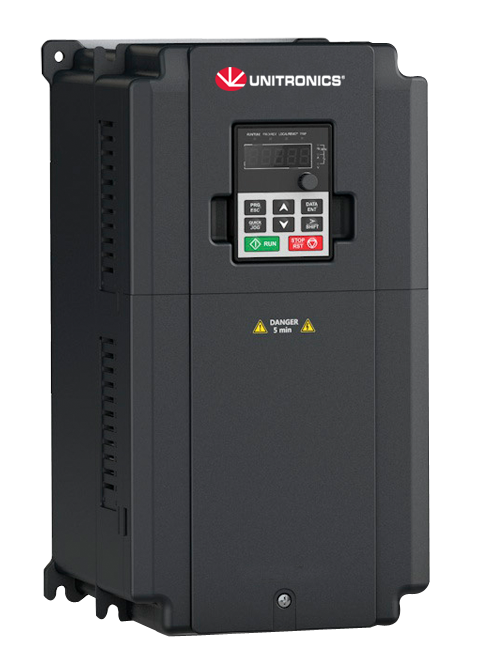 As the application’s motor speed requirements change, the VFD can simply turn up or down the motor speed to meet the speed requirement. For example, with a water pump- as the tank fills up the speed can be reduced. Firstly, it is very complicated to alter a 50Hz alternating current frequency so we convert the AC in to DC using 6 diodes. This allows current to flow in one direction and providing a Direct Current (DC) power supply. This current can then be switched (very quickly) to form a coarse AC current that we can control by the switching frequency. Capacitors are added to add some smoothing but in basic terms this is all an Inverter drive is doing. As the motor speed is directly proportional to the voltage and frequency applied it all becomes very simple. Then the Inverter drive manufacturers add lots of features to automate acceleration, declaration and ‘motor over current protection’ and it gets more complicated with lots of parameters to set up. I guess this is where we come in, guiding you through the process and integrating the VFD with the PLC & HMI to get all the information back to a central control place – the PLC. 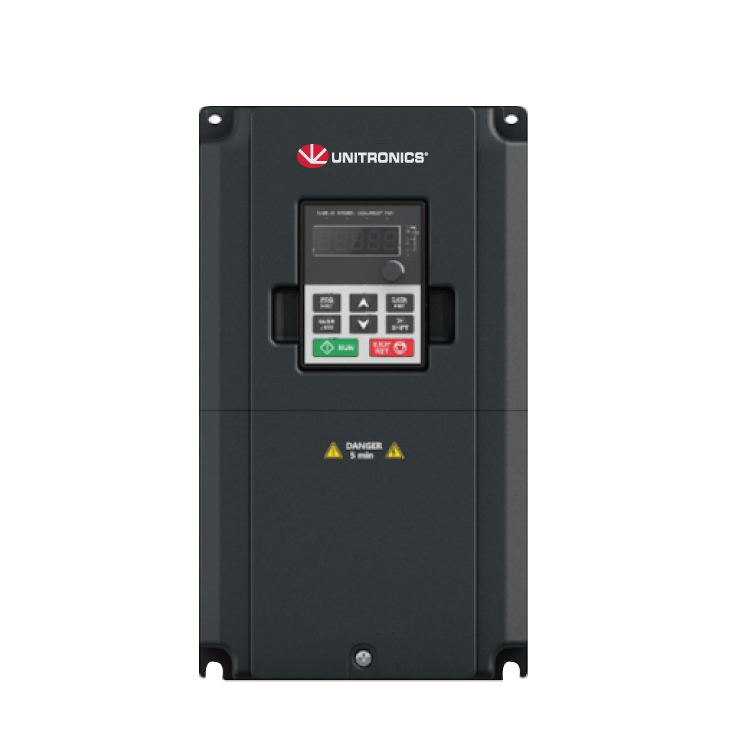 For example, the UniStream PLC can be pre-programmed to configure all the required parameters on power up as well as being ready to monitor the drive parameters live - speeding up installation and reducing the cost of ownership. External Keypads, Filters, Braking resistors, Flange Mounting Pole etc. Please feel free to pick up the phone or use the contact us page for a free no obligation demonstration, quotation or just a chat about your application and how it all works.